Lama Jabb’s book was featured on the High Peaks Pure Earth Reading List last year. This summer’s reading list will be online soon! After six trips to Tibet between 1981 and 1989 and writing thousands of words on what happened there after the Chinese invasion in 1950, is it stupidity or ignorance that kept me from knowing anything about Tibetan literature? From Lama Jabb’s fascinating book I see at last that literature has been an outstanding tool in Tibetan resistance to China’s cultural evisceration. I was not surprised to hear that Tibet has a long and varied literary tradition of poetry and prose, nor that this tradition has influenced writing in modern times. Where is this not true? 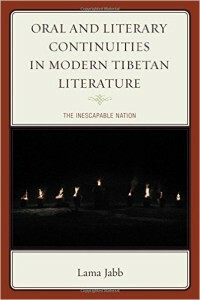 But after a survey of this literature’s many forms, which requires learning the wholly unfamiliar names of many authors and genres, both past and present, what amazes me is how bravely and often cleverly Tibetans writers today use metaphor and traditional themes to lambast the Chinese occupiers. 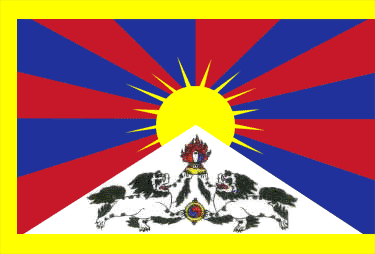 They are taking a considerable risk of imprisonment; written criticism of Communist rule whether in China proper, in the parts of China where many Tibetans live, or in Tibet proper, can lead to serious punishment. “This abstract elegy, “ Jabb tells us, “ …is a coded allusion to the activism of fiery self-immolations spearheaded by the Tibetan clergy inside Tibet since 2009,” – the well over 100 deaths have been examined in detail in Tsering Woeser’s most recent book, “Tibet on Fire,” – and will be widely read and understood by Tibetans who have access, these days, to electronic means for tuning into subversive literature – as can China’s Tibetan informers, which means even such reading is perilous. Today remain silent beneath the land under your feet? Lama Jabb puts it well: “the frequent use of metaphors such as ‘red wind,’ and ’wild yak,’ and their status as unifying imageries, demonstrate how cultural trauma serves as a rallying point for the Tibetan people…these figurative expressions reinforce Tibetan solidarity.” I’m sure they do, and I am grateful to Lama Jabb for raising the curtain on this intense and tragic drama. Hello. I’m wondering if High Peaks Pure Earth will be publishing a review of my book TIBET ON FIRE: BUDDHISM, PROTEST, AND THE RHETORIC OF SELF-IMMOLATION. I see Jonathan Mirsky has reviewed Michael Buckley’s book and has just written about a study of Tibetan literature. http://www.palgrave.com/us/book/9781137373731 Please let me know if you have difficulty obtaining a review copy.